The Monday November 14th Supermoon was the biggest and brightest the world has seen since 1948. Supermoons tend to produce even higher tides which are known to increase the energetic pull on our bodies and our emotions. Spiritually the full moon is deemed to be a formidable time for meditation, energy healing and recharging human energy field and chakras. It is the perfect time for a Supermoon meditation to explore the feminine connection with the moon and how to harness that energy for our fertility and sexual energy. 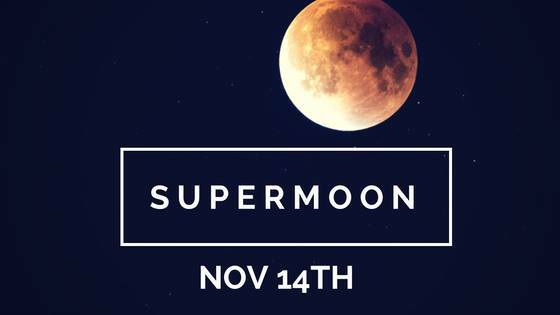 Luckily the full moon energy spans three days before and three days after, so if you couldn’t take a moment out of your schedule to join me live on Facebook the night of November 14th, you’ve got about a weeks worth of wiggle room to take advantage of my supermoon meditation! If this meditation, and learning how to connect more with your cycle and the energies of the moon is calling you, I want to tell you a bit about the 4 phases of our cycle and the moon. The pre-ovulation phase before we release an egg – related to the Maiden energy of the Crescent moon. Ovulation when the egg is released – the Mother energy of the Full Moon like we have going right now. And finally menstruation when we bleed – the Wise Woman energy of the New Moon. Each physical phase goes hand in hand with spiritual, emotional, and mental changes, a cycle of shifting energy that we can tap into to help us understand and heal ourselves and our bodies. I’ve created a series of meditations for each phase of the menstrual-moon cycle that will help you connect the moon with your own cycle. Discover more about each energy and grab your meditations HERE. They’re only $3.99 and literally yours forever! Your glow will be gorgeous and undeniable…Get your moon meditations now.